Begin early in the day. Frozen cherries can be used as long as they're thawed in advance. Add the yeast and a pinch of sugar to the warmed milk and allow it to bloom for five minutes. In the bowl of a stand mixer fitted with a paddle attachment, combine the remaining granulated sugar, 1/2 cup (1 stick) of butter, and 1 tsp of salt. Beat, at medium speed, until fluffy. Add the eggs, one at a time, to the mixture in the bowl. Scrape down the bowl after each egg has been fully mixed in before adding the next. Continue mixing until the mixture is airy. Once the yeast has bloomed, add it to the butter-egg mixture with the mixer running on the lowest speed. Add two cups of the flour to create a thick batter. After you've incorporated the two cups of flour, your batter should be really thick. Slowly, a cup at a time, add the remaining flour, mixing on the second speed. Knead for a full ten minutes. Remove the bowl from the mixer and take the dough out of the mixing bowl. Grease the bowl with butter, baking spray, or a neutral-tasting oil and return the dough to the bowl. Turn the dough over to oil the surface of the dough. Wrap the bowl in plastic wrap and set the bowl in a warm, draft free place. Allow the dough to rise until it's doubled in size (about 1-1 1/2 hours). In a small mixing bowl, beat together the brown sugar, the remaining butter, and cinnamon, using a hand mixer, until light and fluffy. In a separate bowl, stir together the cream cheese, powdered sugar, lemon juice, vanilla extract, and the remaining pinch of salt at low speed. Once the sugar is mixed in, increase the speed, and whip until airy. Cover the bowl, and refrigerate this finished icing until ready to use. Grease a 9x13" (or larger) baking pan with non-stick baking spray. Pre-heat your oven to 350°F. Once the dough has finished rising, punch it down to expel the gases that have developed during while it was rising. With a rolling pin, roll the dough out into a 12x16" rectangle. Use an offset spatula to spread the cinnamon-sugar schmear over the surface of the rectangle leaving a 1" margin on the wide edge farthest from you (for sealing after rolling). Spread the cherries over the dough covered in the schmear, avoiding the bare margin. Beginning with the edge closest to you, start rolling the dough tightly. Pinch the bare section of dough to the underside of the roll to seal the dough. Cut the sweet roll into 12 slices of equal size. Arrange the slices in the prepared pan leaving a 1" space all around each slice. Cover the pan with a clean kitchen towel. Allow the dough to proof (or rise) in a warm, draft-free area of the kitchen for 30 minutes to 1 hour, or until they have doubled in size. Put the pan into your preheated oven and bake for 20-25 minutes, or until they are golden brown. Allow the sweet rolls to cool for 10 minutes before icing. 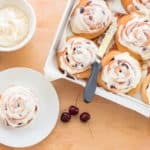 Scoop a dollop of cream cheese icing onto each sweet roll. Allow the residual heat to melt the icing slightly. Serve immediately, or store in an air-tight container for later enjoyment. If using frozen cherries, thaw first. Drain liquid both after thawing and after cutting. Store any leftovers in the fridge for 3 days, or on the countertop for a day. If you plan to freeze the rolls, do so prior to icing them. Cool the sweet rolls completely. Wrap the rolls in plastic wrap and place them into a freezer storage bag. Freezes well for to two months. Remove them from the freezer and allow them to come to room temperature, then ice them.